Picture Jasper helps create harmony, proportion, creative visualization, positive things in business pursuits. It brings and shows hidden messages from the past as well as hidden thoughts, fears and hopes. 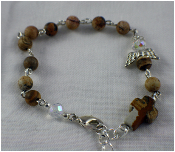 Picture Jasper is a stabilizing, balancing stone that aids in visualization and meditation. Picture Jasper is useful as an emotional and psychological healing stone.